...so if you’re serious about your skiing you’ll rarely find the more challenging slopes too busy. That said the options are limited for better skiers unless you use a guide to access the backcountry. But for beginners and intermediates it’s a wonderful resort – and scenically there are few in the world to compare, especially at sunset when the peaks turn every shade of mauve, pink and purple. Unfortunately most of Cortina’s ski areas are only linked by bus, which can be a hassly way of getting to the slopes, especially in ski boots. But the bus service is free with your lift pass and very efficient. And as an added bonus you also have access to the mighty Dolomiti Superski area, which claims to be the biggest linked ski area in the world with 1200km of groomed slopes and 450 lifts. 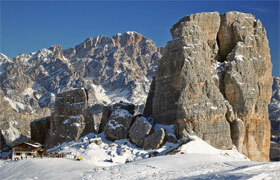 You can’t actually ski into Cortina – the various ski areas are all a lift or bus ride away from the town centre. Most accessible is Faloria, reached via a cable car from close to the bus station. From here you can access the spectacular terrain of Cristallo. 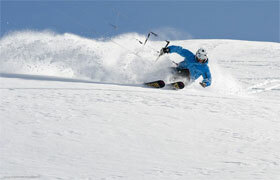 Just north of town is the small Mietres ski area, which consists mainly of blue and red runs. The highest and most dramatic ski area is Tofana, which rises to 2830-metres and is reached via a number of linked cable cars from just outside town. 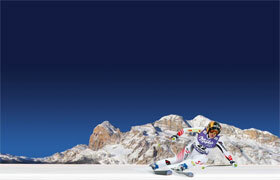 From here you can also access Cortina’s largest ski area of Pomedes and the popular Socrapes beginners’ runs. Also available on a Cortina ski pass – and well worth a visit despite the 20-minute bus ride – is the scenic terrain of Cinque Torri from where you can access the small, north facing Col Gallina area, and the mighty crags of Lagazuoi from where you descend into the Hidden Valley. 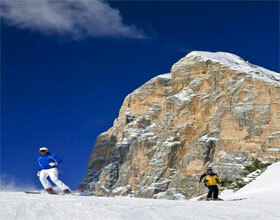 Cortina is great for beginners, with the nursery slopes of the Socrapes area being especially user-friendly. 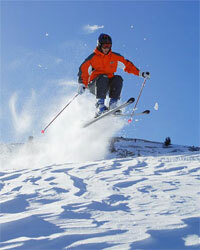 There are four ski schools, which received mixed reports and can at time have a very Italian insouciance about them. Intermediate skiers who don’t mind repeating the same runs will enjoy the Tofana, Faloria and Cinque Torri areas – the spectacular mountain scenery alone ensures you’ll never get bored. Advanced/expert skiers will find the options limited though – the steep black at Tofana is fun, and Staunies from the top of Cristallo is challenging when open - which isn’t often. After a fresh dump the snow beside the pistes can remain relatively untracked for some time since Cortina isn’t a place that generally attracts off-piste skiers, but beware – bizarre as it may seem, the resort is patrolled sporadically by alpine carabinieri (police) who may fine you for skiing off-piste due to the authorities’ fear of litigation in the event of an accident! Book a day out with Guide Alpine (+39 436 868505) in town if you want to ensure you enjoy the best off-piste or ski touring at the same time as staying on the right side of the law. Other than novices all skiers will enjoy the lovely Hidden Valley run through magnificent mountain scenery and finishing with a horse-drawn lift ride, and the fun but busy Sella Ronda circuit is also accessible by free ski bus from Cortina. Lifts are generally fast and efficient but at peak season queues may be a minor problem, especially on the ever popular Sella Ronda. Snow conditions are not that reliable and can vary enormously from year to year. However, ninety per cent of Cortina’s ski area is covered by snow machines, so when Mother Nature won’t play ball you’ll still be able to ski. There’s a wide range of options – great pizzas are to be had at Pizzeria Al Passetto at via Marconi 8, whilst the Grill de la Posta on piazza Roma, 14 has a nice atmosphere. 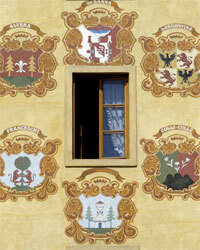 Or for high end dining head to the Michelin-starred Tivoli just outside town. But Cortina is really all about mountain dining, with few mountain restaurants failing to provide superb fare - don’t miss the Rifugio Averau, above Cinque Torri for its fantastic views and great pasta and wine, or the Rifugio Duca d'Aosta in the Tofana/Socrepes area and the Blues Bar Lacedel at the base of Socrapes which is popular when the skiing ends and as the name suggests has good music. Part of the reason to ski in Cortina is to be immersed in the alpine charm of the town – wander along the attractive piazza of Corso Italia in the evening and people watch, pop into small wine bars such as Enoteca on Via del Mercato and try one or two of their 700-plus wines. Nightlife isn’t quite as wild as you might expect from such an iconic resort, although the Hotel Poste on Piazza Roma is usually pleasantly convivial, whilst the Clipper Bar on Largo Poste has loud music and a friendly atmosphere, and tends to get busier as the night draws on. 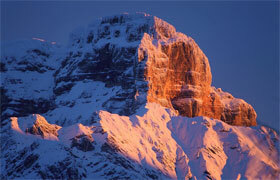 Cortina is a good choice if you don’t wish to ski all day, every day. Check out the fascinating First World War tunnels and defences burrowed into Mount Lagazuoi; enjoy a good range of cross-country ski trails (70km in total); or enjoy the easy walking trails in the Socropes and nearby Pocol areas. Back in town, one can compare Cortina d'Ampezzo to Courchevel in France. You can buy everything from jewellery and artwork to an ocean going yacht in the town’s glitzy shops and boutiques, with furs in particular being a big favourite. See how the other half live at ‘Bulgari’ or ‘Giulio Veronesi’, both on Corso Italia, or for more realistic retail therapy the ‘Co-operativa di Cortina’ department store, also on Corsa Italia, is amazingly well stocked. 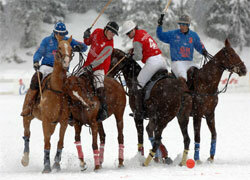 Watch a game of polo on the snow if you’re in town at the right time. There’s also a swimming pool and skating rink, and perhaps best of all, you can take a day trip to nearby Venice and see it at its most romantic, in winter. You will find several holiday rentals on Mediahols.com. For those who prefer to stay in a hotel but are on a budget, try the Hotel Villa Resy. Moderate rates are on offer at the Hotel Villa Argentina which is situated on the edge of the Pocul ski area with tremendous views and within easy reach of the World Cup Downhill ski race held annually on the nearby slopes. And for those who live up to the expectations of the resort, we recommand the Cristallo Palace Hotel & Spa. How to get there? Venice Airport (VCE) 160km/100ml (2.5hrs); Treviso Airport (TSF) 132km/82mls (2hrs). 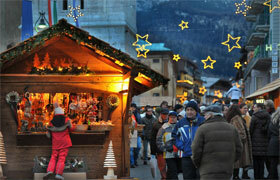 Transfers available Sat and Sun for hotel guests, otherwise good train and bus service between airports and Cortina. Looking for a resort that suits you best? 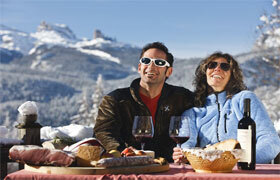 Check out our ski resort guide. If you fancy skiing "somewhere different", go to Macedonia or go for a "cult ski runs tour".